The key to having tasty cappuccino is using a high-quality coffee machine. The coffee shop is a good place to get amazing cappuccino. Nonetheless, you will save some cash if you buy your own home coffee maker. Besides, you will not have to leave home just for a cup of coffee. 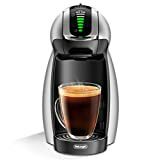 Now, the market is full of coffee makers that it can be confusing deciding which one to buy, especially when every manufacturer says theirs is the best. That is why buyers’ guides exist to help you identify what you need. In that regard, below is a guide on the best cappuccino machine for home use. Aicok is a 4-in-1 product. It can make you a cappuccino, latte, moka or espresso. On design, this brand comes in a silver color and a few black highlights. It has room for two cups though. The separate milk frother exists for extra convenience. The automated temperate control ensures you drink coffee at your desired temperature. Enjoy a great cup of cappuccino considering the high pressure this product provides. It is able to grind coffee perfectly ensuring a rich taste. This brand is quick thus saves you time especially when in a hurry or busy. The reservoirs have a capacity of 1.5litre thus can serve several people before needing a refill. You will love the 26-inch cord. Ninja is pod free, to begin with. 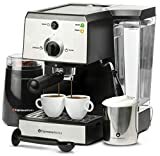 As one of the best cappuccino machines for home use, it provides you a great frother, and accommodates a variety of cup sizes including ordinary cup, XL cup, XL multi-serve and travel mug. Choose between cold and hot froth for that mouthwatering drink. This brand boasts of an advanced thermal tech for favor extraction. Adjust ground amounts if you need stronger coffee. There is milk, flavorings and creamers not forgetting over ice brew. You can be sure of high quality, delicious coffee. Like Mr. Coffee, Gourmia holds one cup at a time. It offers you cappuccino, classic coffee, and latte. This product has pre-programmed controls. Each mode has only three buttons for easy use. The modes are all adjustable to suit the cup size you are using. The best cappuccino machine for home use should have a milk frother. Gourmia has it, thus it is a worthwhile purchase. It lets you adjust the frothiness to fit your preference. Do not worry about cleaning the frother. It has a self-clean capability and is removable. To boost hygiene, the water reservoir, cup shelf and drip tray are all removable for easier washing. Gourmia is high quality, efficient and safe for your health. Delonghi is an elegant piece. It is a single serve brand that offers users over 20 coffee types such as lattes, iced drinks, espressos, macchiatos, roast coffee and of course, cappuccino. The product uses smart pod tech delivering high pressure needed to make aromatic drinks. Operating this device is not difficult. The toggle stick and eight-LED display gives you the freedom to decide how strong you want your coffee. If you are yearning for iced drinks, DElonghi is what you need, because it is iced-compatible. Its water tank is big enough for home use. Hamilton Beach is a credible home appliance brand. It operates on 15bars of pressure to give you excellent coffee. It has a slide and lock holder that eases set up. You will take minutes to have the coffee machine in place. Operating it is also easy and requires little effort. The steam wand swivels to steam and froth milk while the drip tray holds your cups steadily. You will appreciate the removable water reservoir. When a brand appears twice in a guide of best cappuccino machine for home use, do not pass by it. Gourmia is such a brand. 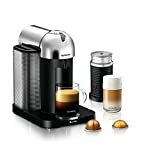 This model is nespresso compatible though. It is an automatic device and employs one-touch control. Simply push a button to make coffee. It also makes you a good latte if you like. It has milk frother too. Keep your machine clean thanks to the removable drip tray, water reservoir and grate. You deserve fresh, rich cappuccino. Breville gives you that. Its redesigned capsules and drip mode is perfect for an amazing cup of cappuccino. This brand uses centrifusion tech that works well on capsules to ensure the best drink. Cup size does not matter; therefore, you can use the machine to make your children coffee. This brand has an advanced thermoblock heating system. It ensures coffee is ready in less than a minute. It also offers accurate cappuccino temperature and steam. You can see through the 1.25L water reservoir. This way, you know when to refill. The tank has a handle to help with refilling and cleaning. Detach the frother and drip tray for fast, easier washing. Treat yourself to double or single shot thanks to the two-port filter baskets. This model of SharkNinja allows you to choose between black and silver colors. Its accessories include a 40-recipe book, scoop, bar system, tumbler and reusable filter that is permanently built. With the advanced thermal flavor tech, you will have access to great cappuccino. Like the other Ninja brand, this one allows you to brew coffee in a cup, travel mug, XL cup and XL multi-serve. The types of brews to enjoy our rich, over ice and classic. Capacity: choose a coffee maker that suits your family size. However, a 1.5L or 1.25L maker is good enough. Milk frother: go for a coffee machine with milk frothing capabilities for a richer drink. Pressure: a 15bar machine is suitable for a home cappuccino maker. It can grind capsules and provide the good coffee you need. Water tank: a transparent reservoir makes it easy to determine whether you need a refill. Control: go for a machine that is easy to use and with as few buttons as possible. Removable features: they make cleaning much easier. Consider buying a brand with a removable tray, a water reservoir, and a drip tray. They make cleaning easier. Multifunctional: a worthwhile product does not only make cappuccino but also other coffee types such as ate, Moka and espresso. When you know what to look for in a coffee maker, it is possible to buy the best cappuccino machine for home use. This way, you do not have to rely on the coffee shop to provide you with rich cups of cappuccinos. A home machine saves you time and money. Besides, it feels great for preparing your own drinks. You now know some of the best brands to consider investing in. Depending on your preferences, choose a product that you like and start to enjoy the home brewed cappuccino. You can more than one brand if you want.